Afternoon from a bright and breezy Barbican, and welcome to our first blog of 2016! (On 21st February… shameful). We’re now happily set up in our new home at the front of The House that Jack Built, and have spent the last 6 weeks enjoying THE WINDOW. We love THE WINDOW. We can wave at passers by, scowl at overly loud motorbikes screaming down Southside Street, survey (and often tut at) the weather and generally be part of the rest of the window-owning community. We loved our first shop, but having access to natural daylight really is a game-changer. Yesterday a lovely lady came running in to buy a bag we had in our window display, which she had seen the night before whilst out on the Barbican for dinner. All hail the power of THE WINDOW. 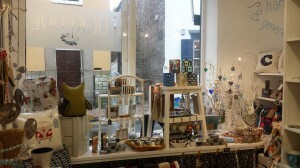 Anyway, we’re very happy in our new home and have had lovely feedback on the new shop. And the move isn’t the only new change for 2016; we now have the lovely Louise working in the shop on Mondays, meaning we’re now open 6 days a week. Louise is the mastermind behind Everyday Wonders, one of our very popular crafty suppliers, so she loves chatting about all things handmade. We also have a couple of new stockists in the pipeline which should be hitting our shelves in March – keep your eyes on our social media for further info! A new start for 2017! Introducing the Theo Paphitis #SBS Shop! Victoria (Lylia Rose) on Introducing the Theo Paphitis #SBS Shop! Niki on None of the Above!